"I rarely make commissions, but at my granddaughter's request I made her this one. 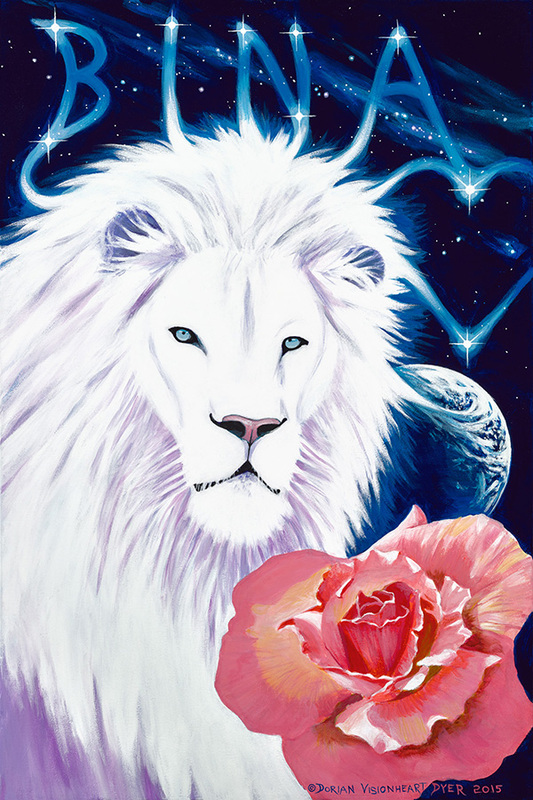 She is 9 yo and is a Leo and wanted me to make her a painting of a male lion, coral rose, and her name in the sky. Her name is Sabina but she prefres the nickname Bina. It was a 5 week project and I was guided to add a few extra elements to the painting. I gave it to her in early October and she was thrilled to receive it. Shortly after she got it the Halloween season began, and she watched some scary movies and found herself scared at night when it was time to go to bed. So to deal with the fear she places the painting against the door to her room facing towards the door and then feels safe and can relax and sleep. My intention in making my art is for it to embody the spirit/soul/essence/power of whatever I am painting. That intention obviously succeeded with Bina's Portrait."